Horsebackriding on scenic mountain trails along with pony rides. Zoological Park with a walk through exotic and farm animals. Hands-on petting and feeding area and narrated tours with an educational program. Playground and picnic area. Just like it was in the 1950's! Myrtl Beach-style mini golf plus 20 station driving range. Horseback riding in summer and winter months. Paintball arena, and snowmobiling in winter. 24 lanes, arcade, snack bar, sports pub. For a real cowboy experience, try our Cowboy Camp. Horseback riding, roping and sorting. Beginners welcome. Family packages, farm tours, wagon rides and more. A traditonal 1950's era roller rink. With go-karts, Arcade, mini-golf, batting cages, shooting gallery, batting cages, picnic area & Kiddie Ride Park, Snack Bar and Restaurant. Rock climbing wall, bungee trampoline and skateboard park with ramps and rails. 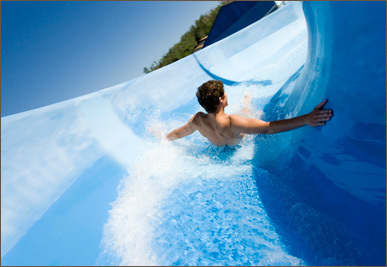 New Riptide Cove Wave Pool. Many Thrilling slides and pools. One low admissions for a full day of water fun. NY's #1 Family Water Park. Food Court. Gift Shop. Group rates available.